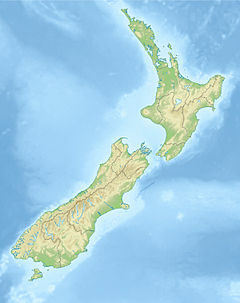 The 1843 Wanganui earthquake occurred on 8 July at 16:45 local time with an estimated magnitude of 7.5 on the Mw scale. The maximum perceived intensity was IX (Violent) on the Mercalli intensity scale' possibly reaching X (Extreme). The epicentre is estimated to have been within a zone extending 50 km northeast from Wanganui towards Taihape. GNS Science has this earthquake catalogued and places the epicenter 35 km east of Taihape, near the border of Hawke's Bay. This was the first earthquake in New Zealand over magnitude 7 for which written records exist, and the first for which deaths were recorded. New Zealand lies along the boundary between the Australian and Pacific Plates. In South Island most of the relative displacement between these plates is taken up along a single dextral (right lateral) strike-slip fault with a major reverse component, the Alpine Fault. In North Island the displacement is mainly taken up along the Kermadec subduction zone, although the remaining dextral strike-slip component of the relative plate motion is accommodated by the North Island Fault System (NIFS). A group of dextral strike-slip structures, known as the Marlborough Fault System, transfer displacement between the mainly transform and convergent type plate boundaries in a complex zone at the northern end of South Island. The presumed epicenter of the 1843 earthquake is not, however, associated with any known fault. The shock was felt over much of North Island and was reported as lasting for three minutes near Mokoia. A magnitude of 7.5 was estimated from the extent of the area that was subject to a shaking level of at least VIII (Severe). At least ten aftershocks were reported on the same day as the mainshock and further shocks were reported until January 1845. Damage in the Wanganui area reached IX-X on the Mercalli intensity scale. Many houses were damaged, and a brick church at Pūtiki was destroyed. There was extensive lateral spreading of the terrace margin to the Whanganui River, and a section of Shakespeare Cliff fell into the river. Two people were killed when their house was swept away by one of the landslides caused by the earthquake. ^ a b c d Eiby G.A. (1968). "A descriptive catalogue of New Zealand earthquakes". New Zealand Journal of Geology and Geophysics. 11 (1): 30–32. doi:10.1080/00288306.1968.10423671. ^ "Significant earthquake". National Geophysical Data Center. Retrieved 28 August 2014. ^ "GeoNet – Quakes". Archived from the original on 15 January 2015. Retrieved 12 January 2015. ^ a b Eileen McSaveney. "Landslide related fatalities" (PDF). Te Ara The Encyclopedia of New Zealand. Retrieved 28 August 2014. ^ Mouslopoulou, V.; Nicol, A.; Little, T.A. & Walsh, J.J. (2007). "Terminations of large strike-slip faults: an alternative model from New Zealand". In Cunningham, W. D. & Mann, P. Tectonics of Strike-Slip Restraining and Releasing Bends. Special Publication. 290. London: Geological Society. pp. 387–415. ^ Van Dissen R.; Yeats R.S. (1991). "Hope fault, Jordan thrust, and uplift of the Seaward Kaikoura Range, New Zealand". Geology. 19 (4): 393–396. Bibcode:1991Geo....19..393V. doi:10.1130/0091-7613(1991)019<0393:HFJTAU>2.3.CO;2.